Announcement We specialize in custom, personalized hand stamped jewelry for adults, children, weddings, including bridal parties, and all occasions, as well as those special moments in your life. From bar necklaces, bracelets and rings to tie clips, cuff links, guitar picks and more. Our products are the perfect personalized, unique gift for mom, brides, new baby, groomsman, dads, teachers and all of the special people in your life. My current turnaround time is 1 - 3 days. 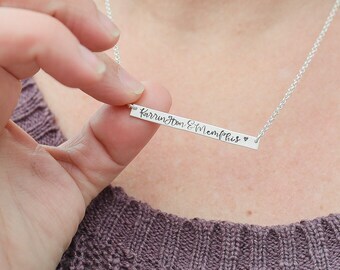 Like Mother, Like Daughter Jewelry (MotherDaughterJewel) - Personalized Hand Stamped jewelry. Sterling silver necklaces, bracelets, rings and more. ♥♥Our current production time is approximately 1 week, this does not include shipping time. Thanks for understanding. It takes time to make your handmade piece. (Aromatherapy necklaces are usually shipped out in 1-3 days). ♥♥For International Orders: You may be required to pay duty and/or taxes as determined by your country. I am unfortunately unable inform you of these costs and whether or not they will occur. UK RESIDENTS: Royal Mail WILL assess an 8 pound handling charge on all parcels of 15 pounds or greater in value, in addition to any tax due. This is unfortunately beyond my control. Thank you for your understanding. "These necklaces are fabulous and the owner is great to work with." "They are perfect!! Great customer service and fast shipping!" "Completely happy with this item, my husband loved it! Super fast shipping and the product was perfect. Hopefully I will an excuse to buy something again." "I just got my bulldog keychain. It's so cute and the engraving is perfect!! I'm so happy I bought it! The seller was so sweet and responded quickly!! The shipping was fast also. You won't go wrong ordering from them!!!! Thanks Karen!!!" "Gorgeous piece. Well-crafted and rapid shipping. Thank you!!" 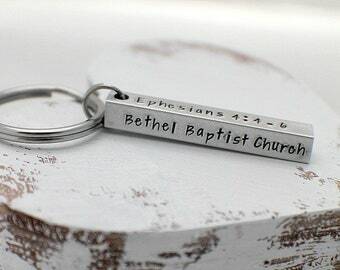 We specialize in custom, personalized hand stamped jewelry for adults, children, weddings, including bridal parties, and all occasions, as well as those special moments in your life. From bar necklaces, bracelets and rings to tie clips, cuff links, guitar picks and more. Our products are the perfect personalized, unique gift for mom, brides, new baby, groomsman, dads, teachers and all of the special people in your life. Beautiful sentiment was so very appropriate, my girls loved it wonderful choice as an Easter present would buy from again. Starting to work with more gold in the shop. I love this one! 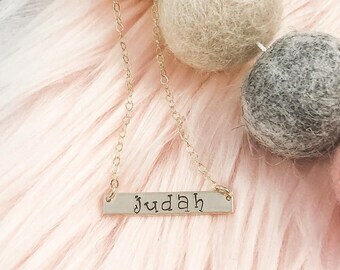 Unique custom gift ideas for bridal parties, holidays and personalized keepsake jewelry. Personalized birthstone jewelry, inspirational and quote necklaces, bracelets and more. 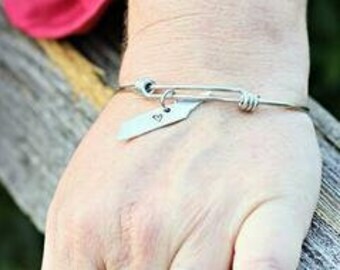 Custom sign language jewelry, hand stamped gifts to Mom and Dad like key chains and personalized newborn baby jewelry. Custom aromatherapy jewelry collections for use with your favorite essential oils. We are a Mother & Daughter team from Middle Tennessee handcrafting personalized keepsakes that you and the special people in your life can hold close to your heart. Using only the highest quality materials, these custom pieces make the perfect gift or keepsake for yourself. Our unique, inspiring designs and collections create timeless pieces that will be cherished and adored. 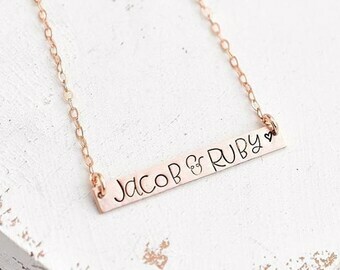 ♥ Personalized Necklaces, Rings and Bracelets. ♥ Memorable Wedding Jewelry & Gifts for Bride, Groom, Bridesmaids, Maid of Honor, Groomsman and more. 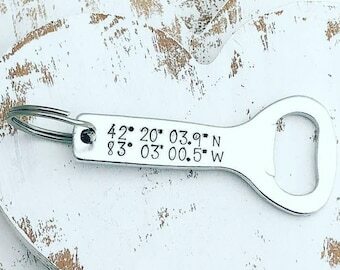 ♥ Unique custom gifts for dad, boyfriend and husbands like guitar picks, collar stays, key chains and so much more. 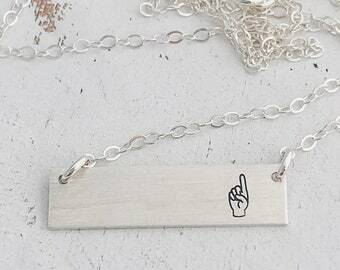 ♥ Stunning gifts for moms, teachers, best friend, grandmother, godmother and aunts like bar necklaces, personalized rings, bracelets and more. ♥ Custom Aromatherapy Collections to use with your favorite essential oils. ♥ Custom Cremation lockets and bracelets. ♥ Miscellaneous and Accessories like headbands, spoons, bubble wands and more. ♥ Personalized and custom birthstone collections. We pride ourselves on creating gorgeous keepsakes, at low prices, without ever sacrificing quality. All of our items are created by hand, stamped by hand, and no two will ever be the same. Each will be unique and custom created just for you. ♥ Custom orders are always welcome and we would be honored if you allowed us to create the perfect piece for you! ♥ We use sterling silver, copper, brass and aluminum discs ~ do not expose these pieces to any harsh chemicals, please store in a dry, airtight bag or container. These metals can tarnish when exposed to air. We include a polish cloth to help you keep your jewelry clean. Thank you for browsing Like Mother Like Daughter. For purposes of EU data protection law, I am the data controller of your personal information. If you have any questions or concerns, you will find my contact details under 'Seller details'.